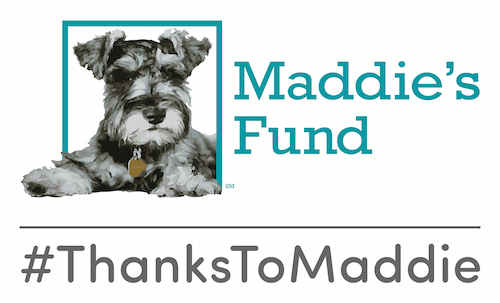 It hardly seems possible that nearly two years have gone by since the Maddie’s Shelter Medicine team at UF was approached by the Humane Society of the United States with an appealing query: Would we be interested in providing shelter consultations in Puerto Rico? The island had long been known for having large numbers of stray animals, overwhelmed shelters, and a high euthanasia rate as compared to the mainland. The HSUS team hoped that our consultations would provide uniform, island-wide shelter medicine practices to promote medical and behavioral well-being, with the ultimate goal of increasing life-saving. Plans for a visit in September of 2017 were postponed by Hurricanes Irma and Maria, but in January of 2018 we finally made our first visit to these resilient animals and people. During that first year we visited five shelters, spending the majority of our time helping the Villa Michelle animal shelter host their first Mega-Adoptathon. 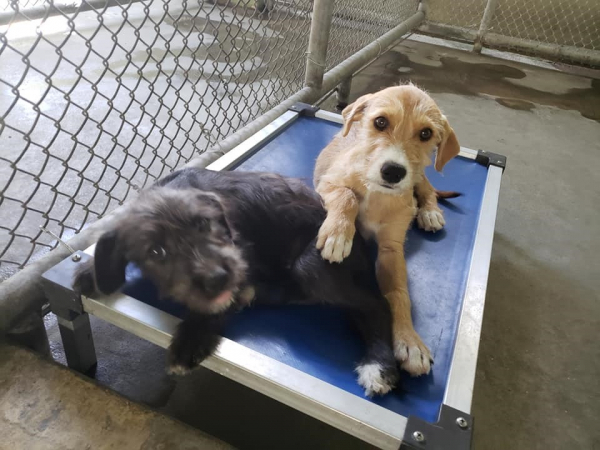 Adopters turned out and took home 206 animals in two days (see July 13, 2018 and August 15, 2018 posts). By year’s end, Villa Michelle had doubled the number of adoptions from the previous year while significantly lowering their intake. We headed back to the island in March this month, traveling to the southwest to begin our day with Dr. Osmar Rivera in Ponce. Dr. Rivera wears many hats, including practicing at an emergency clinic in San Juan and helping several shelters. 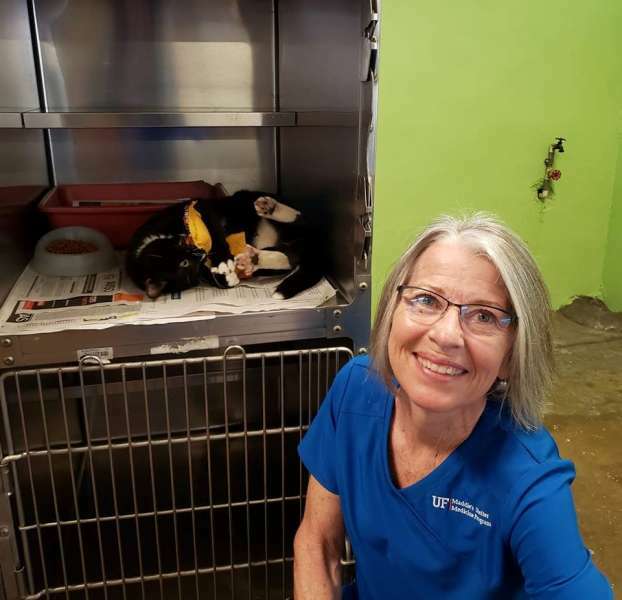 After his training at the ASPCA Spay-Neuter Alliance next month, he hopes to open a high quality, high volume spay neuter (HQHVSN) clinic at the Ponce shelter. He also has an interest in TNR of community cats and has a mobile spay-neuter vehicle. 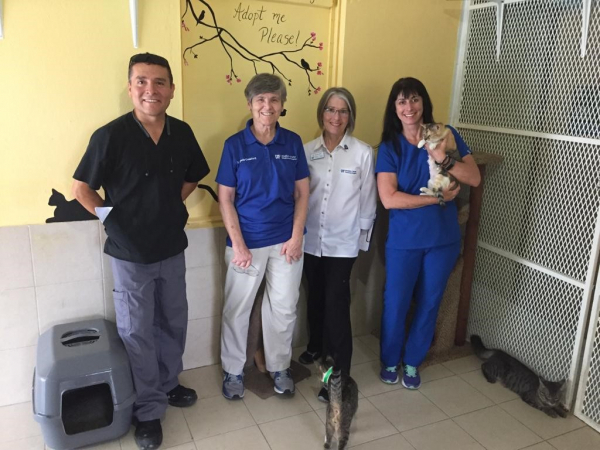 Our next stop was a visit with Stella and Dellymar at the San Francisco de Asís Animal Sanctuary in Cabo Rojo. These two dedicated women provide shelter, affection, and veterinary care to homeless, special needs cats and dogs. In addition to sheltering lifelong residents, this hard-working team transfers adoptable cats and dogs to shelters in Puerto Rico and on the mainland and provides TNR to the cats they encounter. They have implemented many best practices according to our recommendations and have improved housing for cats and dogs with lots of daily enrichment. Our final stop of the day was back at Villa Michelle. There we met two new board members, one of whom gave a PowerPoint presentation on their challenges and goals (double the adoption rate, again!) for the coming year. We were thrilled to see that several of our recommendations have been put into action (cage cards and identification for each animal, and improved preventive health care practices). A highlight was observing the cats enjoying the remodeled catio that had been a labor of love by newly-hired veterinarian Dr. Renan Zuniga. We spent the next morning at the municipal shelter in San Juan with their lead technologist, Rosana. 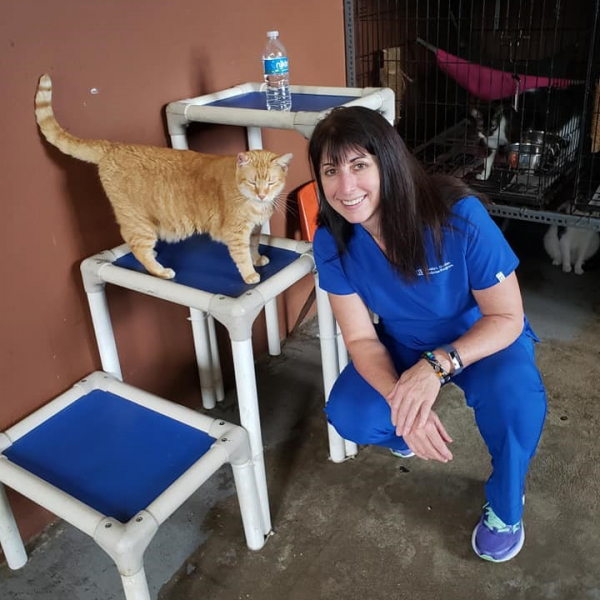 Rosana is bright, dedicated, and incredibly organized, and has implemented many of our recommended preventive health care practices for the San Juan shelter animals. Additionally, she provided training to the reception staff in pet retention strategies. Rosana, along with technologist Deborah, and their two ,will attend the ASPCA Spay-Neuter Alliance training in June. This training will improve the surgical team’s efficiency and provide experience/comfort with pediatric spay-/neuter, which will expedite placement of puppies and kittens into new homes. 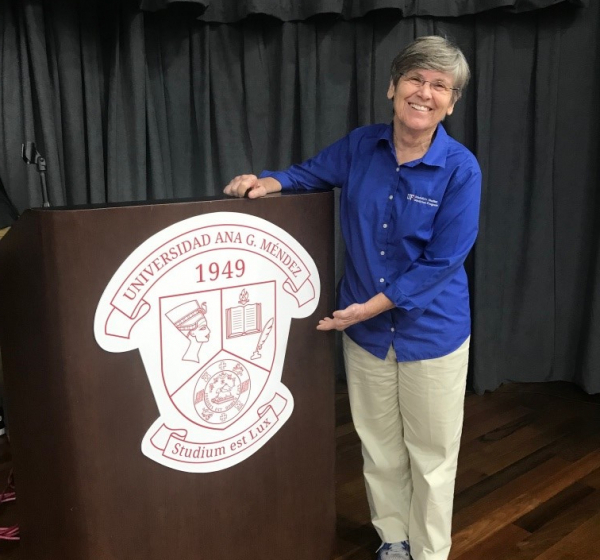 Our evening was spent at the Universidad Ana G. Méndez, Gurabo, where MSMP Director Dr. Cynda Crawford spoke to an audience of 100 attentive technician and technology students, veterinarians, animal welfare professionals, and faculty on Preventive Health Care for Shelter Animals: How to Keep them Healthy for a Home. In addition to describing the unique challenges faced in animal sheltering, we hope this conversation inspired the many students in the audience to consider shelter medicine as a career path. Our plan is to provide continuing education each time we return to the island. 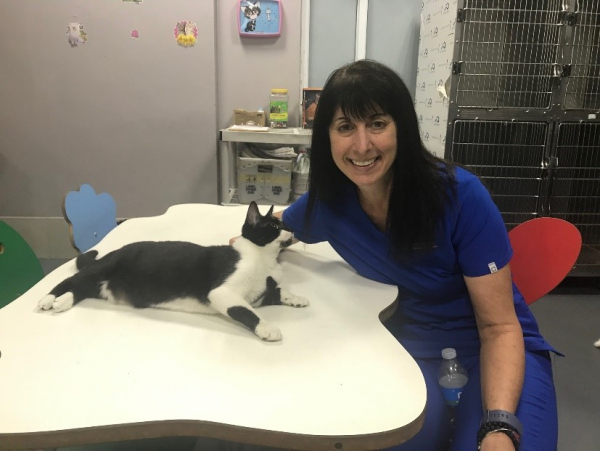 The next day we headed to the Carolina municipal shelter, where they had followed our recommendations of separation of species (so important in lowering stress in cats) and reduced holding times to decrease overall length of stay. 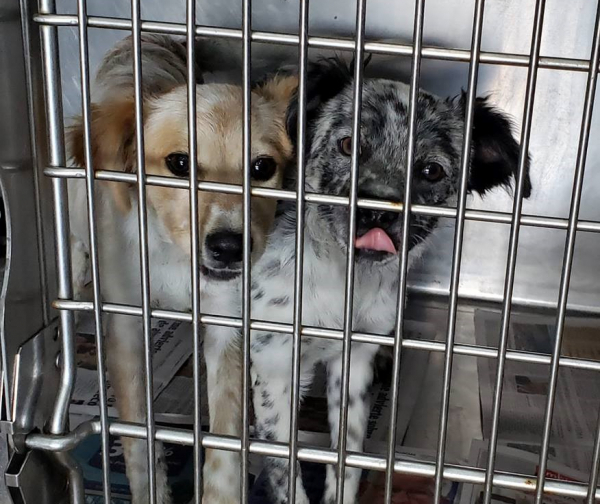 Their shelter veterinarian is also applying to train at the ASPCA Spay-Neuter Alliance and, as discussed with our intern Dr. Meaghan Miehlo last November, has begun tattooing post-op (indicate that the animal has been sterilized. Our final stop was the Humane Society of Puerto Rico. 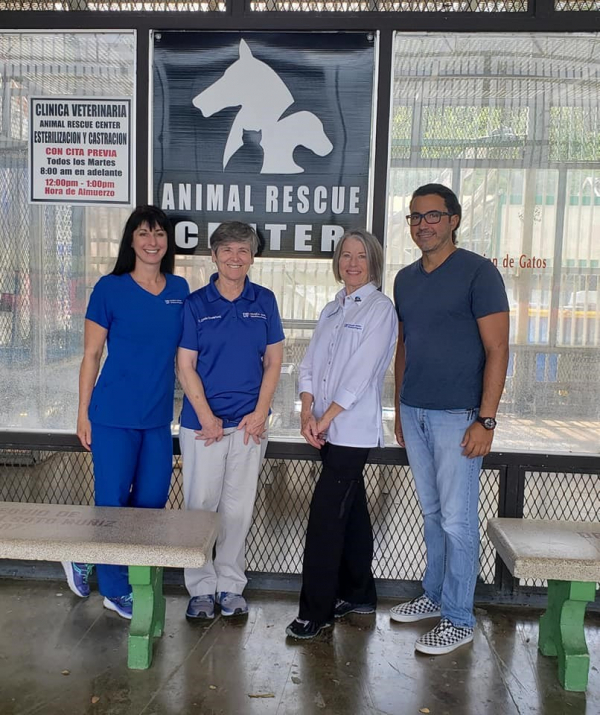 Their very progressive director, Maritza Rodriguez, showed us the newly renovated puppy holding area and a new, outdoor catio. Both of these housing options provide the animals with more space and enrichment. Since receiving their ASPCA Spay-Neuter Alliance training, two of the HSPR surgeons are now comfortable with pediatric spay-/neuter, allowing puppies and kittens to move more quickly through the shelter. HSPR is active with transport of puppies and kittens to the mainland. Thanks to Dr. Sarah Kirk for taking us on this journey of lifesaving with the UF Shelter Medicine Team!